WASHINGTON: Colluding with Russia? The special counsel says no. Cheating at golf? Well, that’s something else. 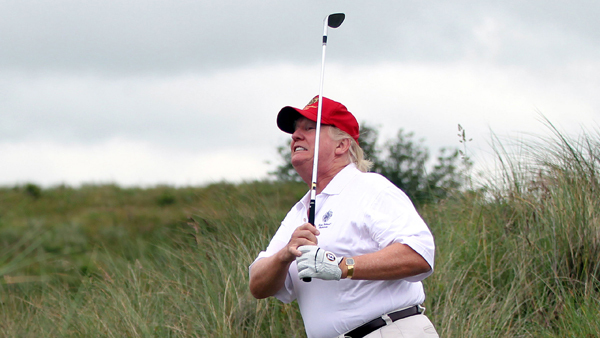 From pulling a fast one on Tiger Woods to exaggerating his handicap, Donald Trump’s alleged misdeeds on and around the golf course are the subject of a new book by former Sports Illustrated columnist Rick Reilly, Commander in Cheat: How Golf Explains Trump. Reilly documents dozens of examples of underhanded golf behaviour by the President, transgressions talked about by pro golfers and duffers alike. “In golf, he’s definitely not exonerated,” Reilly said. “There’s been dozens and dozens of people that can declare him guilty of cheating.” One infamous instance came in a 2017 round with Tiger Woods and Dustin Johnson, who is the current No. 1 player in the world. The President’s playing partner, Fox Sports golf analyst Brad Faxon, reported that Trump’s offences included putting down a score that didn’t account for two balls he hit into the water on one hole. But outside of formal tournaments, golf is a game of honour in which individual players act as their own referees, keep their own scores and assess themselves penalties for rule violations. Trump’s cheating, Reilly said, motivated him to write the book. Reilly quotes players who accuse Trump, his caddie and Secret Service agents of regularly moving his golf balls out of difficult lies. At Winged Foot Golf Club in New York, the only non-Trump property where the President is a member, Reilly writes, “The caddies got so used to seeing him kick his ball back onto the fairway they came up with a nickname for him: ‘Pele.’ ” That’s the world soccer star from Brazil.